It’s the season of colours, bhang and masti. But it also reminds us of the havoc it wrecks on our skin and hair. Don’t worry as we have got you covered! With our skin and hair care tips; you will surely have a happy Holi. Start off by using a toner to close your skin pores as it helps in reducing the damage on your skin. Make sure that you apply sunscreen generously before you go out to play Holi. As you will stay outdoors for longer, the sunscreen will protect your skin from damage. c) Oil is your best friend! Before you go out ensure that you have lathered either coconut or olive oil on your hair, face, hands and legs. The oils will protect your hair and skin from damage by harmful chemicals, while it also makes it easier to remove the colours. Protect your finger and toe nails from the harsh colours by applying a nail polish (preferably transparent nail polish). Protect your lips by using a good lip gloss/lip balm. DO NOT apply makeup when you go out to play Holi. 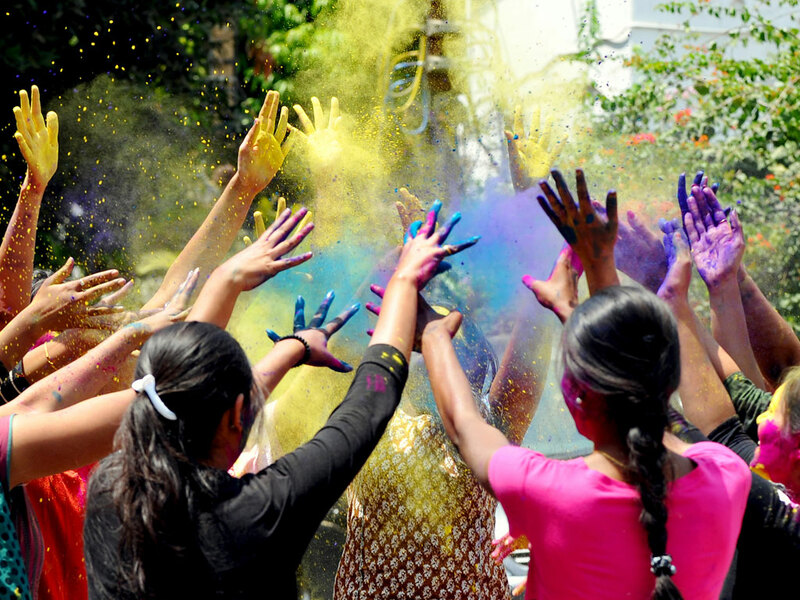 Chances of allergic reactions are high due to the combination of chemicals in cosmetics and the Holi colours. Wear full sleeved-cotton clothes. Avoid denims. You may feel heavy once drenched in the coloured water. Cotton shorts or pants are perfect wear. a) Stay away from the sun! After playing Holi, stay away from direct sunlight as your skin and hair is covered in chemicals. If you stay in the sun, then the colours get dry and it becomes increasingly difficult to wash them off. Before applying your shampoo/body wash, rinse off the colours from your body repeatedly. Do no use a body scrub; instead use a loofah and a mild body wash for your skin. Always follow up with a conditioner for your hair. If the colours are being stubborn to remove, then apply generous amounts of oil on that area. This will help wash off the colours easily. Remember to apply a moisturiser all over your body to replenish the lost moisture from it. The moisturiser also helps in lightening colours that are still stuck on your skin. To bring back the ph-balance of your skin, go for a rejuvenating face mask. This helps in restoring the moisture and will replenish your skin.